Preparing students to be leaders, ambassadors and teachers of Lakota language and culture for future generations. The Lakȟól’iyapi Wahóȟpi preschool opened its doors in September 2012 to the first cohort of eleven 3 year olds. Since that time, seven more students have entered and the students from the initial cohort are now in their fourth year of the immersion program (see section below for details on the K-2 classroom). The children in this immersion school are 100% immersed in the Lakota language for 8 hours a day, 4 days a week! All instruction is conducted in Lakota with lessons mixing traditional Lakota seasonal and cultural knowledge with best practices in early childhood education. ​The curriculum also follows North Dakota early childhood guidelines. To address our students' needs and support their growth, the school has expanded to include a K-2 classroom called Wičhákini Owáyawa ("New Life for the People School"). With support from the Administration for Native Americans, we have been able to add a new grade every year. As our students progress, we hope to add grade levels until we have a full K-12 school, with the dream of also creating a higher education immersion program. Our current K-3 class has 8 students, ages 5-9. All of the content is delivered in the Lakota language through an indigenous language medium model, blending a well-rounded range of educational subjects including math, reading, and science with the traditional cultural Lakota/Dakota teachings. Subjects such as math and reading are also aligned with the Common Core & ND State standards. The Lakota Restorative Teachings Initiative is a collaboration between Sitting Bull College, Wičhákini Owáyawa and Kampus Kids Learning Center. The program, supported by the American Indian College Fund (College Fund), focuses on promoting health, well-being and security of Native families at Sitting Bull College and within the greater Standing Rock community. The Restorative Teachings Initiative has provided our parents, teachers and students with a remarkable opportunity to embrace a holistic approach to language learning. The initiative has brought a fruitful collaboration between Lakȟól’iyapi Wahóȟpi/Wichákini Owáyawa, the Sitting Bull College Division of Education and Kampus Kids Learning Center. Each program is supporting Lakȟótiyapi by integrating Lakota language and culture in their program through the use of monthly themes, which lesson plans are built around. Since March, using these themes as a guide, the Nest has been busy incorporating hands-on cultural activities promoting sustainability, food sovereignty, and wellness into the curriculum. 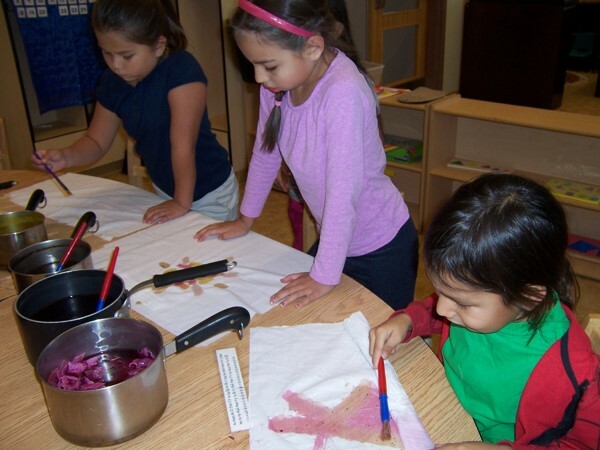 For example, as part of classroom activities to learn the alphabet, K-2 students learned how their Lakota ancestors used plants to make dyes (Ilúlye) for porcupine quills and other decorative materials. They chopped up various plants that were boiled for an hour. When cooled, the students painted on muslin with their colored dyes. This was a cultural activity for the letter “Ii”, which integrated scientific standards, promoted independence by showing students how to create their own materials, and was taught fully in Lakota. For us, the strength and health of the Standing Rock community depends on the vitality of the Lakota language. Through our work with the Restorative Teachings Initiative, we’re able to ensure that the youngest speakers of the tribe are healthy and receiving support spiritually, emotionally, mentally, and physically.